Photo: © D. Lawson Gerdes. The gray treefrog is common in Minnesota and throughout the eastern United States. It is often seen near swamps (wetlands that have flooded trees and shrubs). It closely resembles the Cope's gray treefrog (H. chrysoscelis) and can only be distinguished in the field by their call. The gray treefrog has twice as many chromosomes as the Cope's gray treefrog. General description: This small frog has toe pads which enable it to climb shrubs and trees. Color: Gray to creamy white. This frog can change colors, so it can be anything from a mottled grayish green or solid green to a gray or creamy white color. The inner thighs on the hind legs of all gray tree frogs are yellow. Sounds: A musical, birdlike trill. 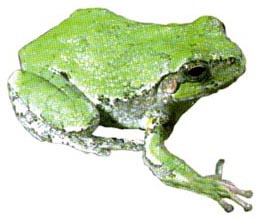 The call is similar to the Cope's gray treefrog, but slower. They may call while perched in tree branches. Gray treefrogs breed in May when they move to breeding ponds. Clusters of up to 30 eggs are attached to vegetation near the surface of the water. The eggs hatch in three to six days. Tadpoles transform within two months. Adults reach maturity within two years. Breeding habitat: Shallow wetlands within or near forested habitat. Summer habitat: Closely associated with woodland and forest habitats. Often found in residential areas where it may be seen on windows feeding on insects attracted to lights. Winter habitat: Terrestrial. Body can withstand partial freezing. Some gray treefrogs spend the winter in a partially frozen state under leaf litter, rocks and logs. People often see them on windows on summer evenings where the frogs feed on bugs attracted to the lights inside.